In probability theory and statistics, the beta rectangular distribution is a probability distribution that is a finite mixture distribution of the beta distribution and the continuous uniform distribution. The support is of the distribution is indicated by the parameters a and b, which are the minimum and maximum values respectively. The distribution provides an alternative to the beta distribution such that it allows more density to be placed at the extremes of the bounded interval of support. Thus it is a bounded distribution that allows for outliers to have a greater chance of occurring than does the beta distribution. where and is the regularized incomplete beta function. The beta distribution is frequently used in PERT, critical path method (CPM) and other project management methodologies to characterize the distribution of an activity’s time to completion. 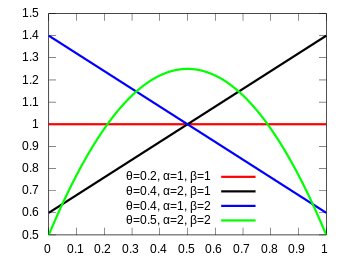 where a is the minimum, b is the maximum, and m is the mode or most likely value. However, the variance is seen to be a constant conditional on the range. As a result, there is no scope for expressing differing levels of uncertainty that the project manager might have about the activity time. The variance can now be increased when uncertainty is larger. However, the beta distribution may still apply depending on the project manager’s judgment. The beta rectangular has been compared to the uniform-two sided power distribution and the uniform-generalized biparabolic distribution in the context of project management. 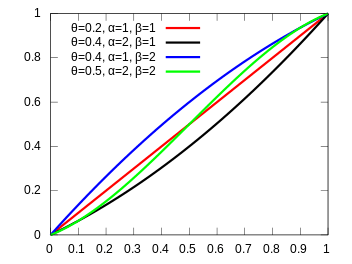 The beta rectangular exhibited larger variance and smaller kurtosis by comparison. The beta rectangular distribution has been compared to the elevated two-sided power distribution in fitting U.S. income data. The 5-parameter elevated two-sided power distribution was found to have a better fit for some subpopulations, while the 3-parameter beta rectangular was found to have a better fit for other subpopulations. ↑ Hahn, E. D. (2008). "Mixture densities for project management activity times: A robust approach to PERT". European Journal of Operational Research. Elsevier. 188 (2): 450–459. doi:10.1016/j.ejor.2007.04.032. ↑ Malcolm, D. G.; Roseboom, J. H.; Clark, C. E.; Fazar, W. (1959). "Application of a technique for research and development program evaluation". Operations Research. 7: 646–669. doi:10.1287/opre.7.5.646. ↑ López Martín, M. M.; García García, C. B.; García Pérez, J.; Sánchez Granero, M. A. (2012). "An alternative for robust estimation in project management". European Journal of Operational Research. Elsevier. in press. doi:10.1016/j.ejor.2012.01.058. ↑ García, C.B. ; García Pérez, J.; van Dorp, J.R. (2011). "Modeling heavy-tailed, skewed and peaked uncertainty phenomena with bounded support". Statistical Methods and Applications. Springer. 20 (4): 463–486. doi:10.1007/s10260-011-0173-0.